"This ranks among the great adventure books". Buy From Us and Have the Book Personally Signed! Important Note: We are the publisher of Never Turn Back and we do not sell to Amazon and other sellers. The new version is only available from us. Don't believe Amazon's hogwash that they are selling "new" copies of the old version. They are not. (Check their cover and compared it to ours.) More information on purchasing. "A triumph! I couldn't put it down." NEVER TURN BACK is the gripping and compelling life story of Dr. Walt Blackadar, a physician from a small town in Idaho. 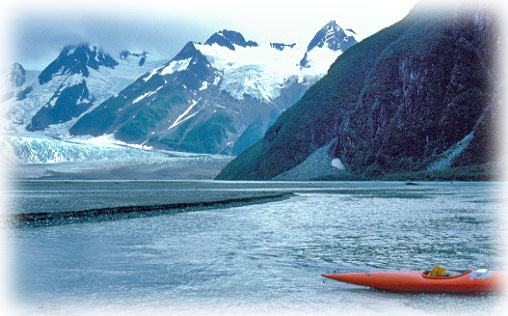 At the age of 49, he shocked the outdoor world when he made a solo kayak journey down the treacherous rapids of Turnback Canyon on the remote and wild Alsek River in Canada and Alaska. 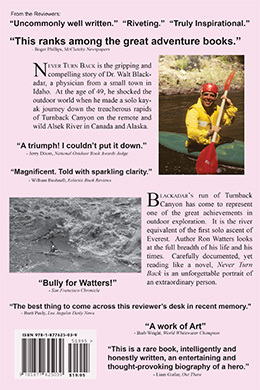 Blackadar's accomplishment on Turnback Canyon was the river equivalent of the first ascent of Everest, and when excerpts from his Alsek journal were published in Sports Illustrated, he became an instant sensation. 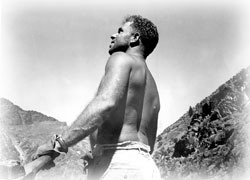 He was at the top of his sport at an age when most athletes are long retired. Then suddenly, his spectacular rise veered wildly off course when a young woman tragically died on one of his kayaking expeditions. Heartbroken over her death and plagued with mounting physical problems, his kayaking technique began to deteriorate. 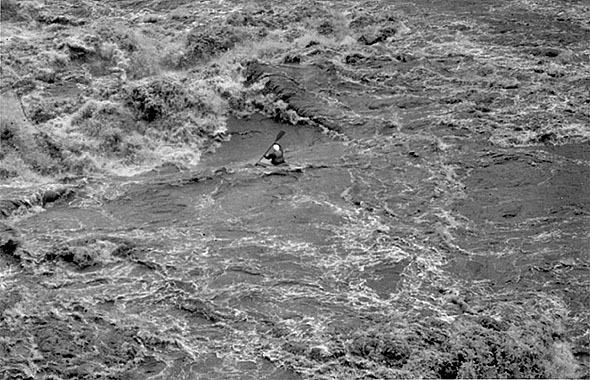 Yet he had a spirit that was irrepressible, and pitting himself in a race against his body's clock, he sought out and faced off against the world's most formidable whitewater. We (Great Rift Press) are the publisher and we do not sell books to Amazon.com or other book sellers. Nor do we sell to distributors. Don't be ripped off. Any internet seller (including those on Amazon) advertising our books as "new" are not being truthful. First off, they are not selling the new version - and they are selling used copies of the old version. Not cool. Here's how to purchase directly from us. "Magnificent. Told with sparkling clarity. Truly inspiritional." This fascinating and masterfully written book is considered one of the outdoor world's finest works. The Los Angeles Daily News awarded Never Turn Back their highest rating for a book: "It's the best thing to come across this reviewer's desk in recent memory," wrote Brett Pauly of the News. "Bully for Watters!" said the San Francisco Chronicle about author Ron Watters' wonderfully told story. William Bushnell of the Library Research Associates called it: "Magnificent...told with sparkling clarity...truly inspirational." 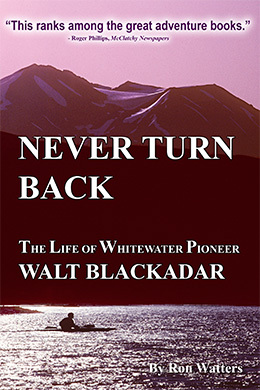 Never Turn Back is the unforgettable biography of whitewater sport's most famous personality Dr. Walt Blackadar. 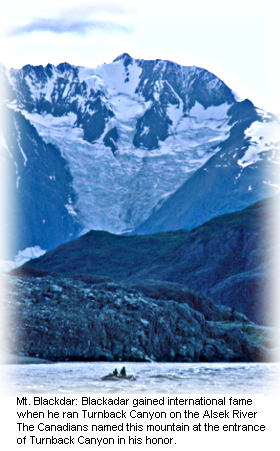 Blackadar stunned the outdoor world when he ran the treacherous rapids of Turnback Canyon on the remote and wild Alsek River in Canada and Alaska. What made his solo journey through Turnback Canyon even more remarkable was the fact that he was 49 years old, an age when most athletes are long retired. Blackadar's story is powerful and uplifting. It is the story of the human spirit facing and overcoming great odds. 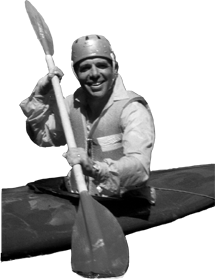 Joining book reviewers in praise for the book are outdoor authorities such as World Whitewater Champion Barb Wright: "A work of art!" Other reviews: "A triumph! I couldn't put it down." "Uncommonly well-written and well-edited." "An inspiring book." "This is a rare book, intelligently and honestly written, an entertaining and thought-provoking biography of a hero." --Liam Guilar, Out There, Australia's Outdoor Magazine. "Watters captures a surprising tenderness and depth to Blackadar. I guarantee you'll come away from reading this book with a lot of smiles and laughter and a contagious feeling that life is worth living to the fullest." "It's the best thing to come across this reviewer's desk in recent memory,"
Details: 296 pages • 6" x 9"
If you are a store owner, go here. We are the publisher and we do not sell books to Amazon.com or other book sellers. Nor do we sell to distributors. Don't be ripped off. Any internet seller (including those on Amazon) advertising our books as "new" are not being truthful. Rather they are selling used books that appear to look new. New Paperbacks. These are truly "new" paperbacks. Plus, it's the new version that you won't find anywhere else - even among Amazon's used books. (To be sure, you can compare their cover with ours.) This is a limited print run and only a few are left. Price: $19.95 plus shipping. If desired, we will have the book personally signed for you. Click "Buy" button (below) to purchase NEW books . . .
New Collectable Hardbounds. We only have two of these left. We will have Ron Watters, the author, personalize the book for you. Price: $2,500. To order, drop us a line at support@grc101.com or give us a call (208-232-6857) and we will make arrangements for you. If you'd like to talk to a real person and order on the phone - or you wish to pay by check - call us at 208-232-6857. We're happy to help!